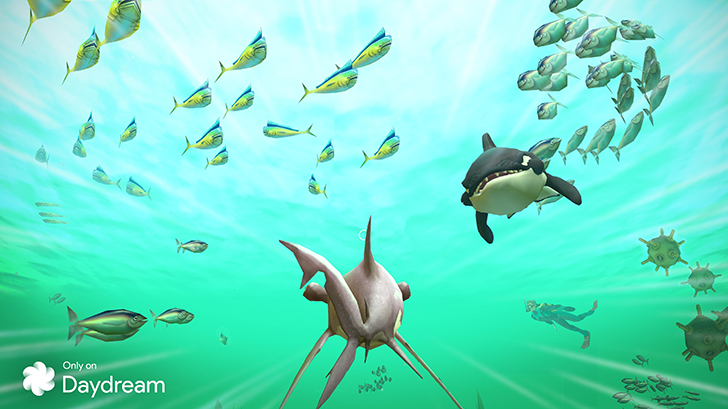 If your worst nightmare is facing a shark while being helpless at sea then swimming as fast as you can only to be eaten by it, then you might be getting a bit of reverse revenge with this new VR game on Daydream. Or maybe your fears will get more solidified. But what's for sure is that you will be able to experience it all in a more immersive way than any movie scene. In Hungry Shark, you play as the shark. That's right, you're the good guy here and you have to fight those terrifying jellyfish and nasty human divers. There are three different mission types like eating as much as you can, racing, and rescuing your shark friends, and they all take place in a 360-degree huge underwater setting where you're free to move, explore, and hunt.